We really enjoyed this excursion. We really enjoyed this excursion. Lot of fun to interact with dogs and learn about the Iditarod. Excellent guides. Informative driver. Learned so much new information! Dog sledding awesome and Tram great. Dog sledding was fun and great to hear the history of the sport. Dog sledding was fun and great to hear the history of the sport. Just wish the excursion was longer on the trail. The dog sledding was a fantastic experience. The dog sledding was a fantastic experience. The dogs were feisty and hilarious, the puppies sweet as can be. This was everyone&apos;s favorite tour. Sled ride was longer than expected. Excellent excursion - learned about the Iditarod from Jeff King, 4 time winner and how the dogs are trained. We were able to hold puppies while we were there. It was a wonderful excursion. Everything you&apos;ve heard is true. Everything you&apos;ve heard is true. The puppies! The sledding! Being on the glacier! My husband and son took a helicopter ride to the top of a glacier and went dogsledding up there. Shaynee was fabulous. She was the musher and taught us so much! She was so sweet and has even completed the Iditerod! We loved this experience. This is a MUST DO. Or shall I say a "Mush Do" hahah! It was very informative and obviously fun to see the puppies but just hearing about the camp/company, was very cool to see. Ralph our driver, was very interesting and even told jokes. Helicoptered up to Glacier where Dog Camp was located...road dog sled and played with the dogs. Helicoptered up to Glacier where Dog Camp was located...road dog sled and played with the dogs. Bright sunny day...could not have been better! Musher Camp. LOVED THIS!!! If you are a dog lover you need to experience this!! They cancelled the excursion due to weather. They cancelled the excursion due to weather. It would have been nice to be notified earlier, or even given the heads up that we might be cancelled as the last minute cancellation prevented us from making other plans. Felt so sorry for the dogs. One of the best things we did! One of the best things we did! The dogs were amazing. it was out in the middle of the rain forest so the scenery was awesome. 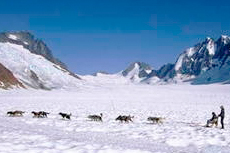 By helicopter to land on a huge glacier and go dog sledding with a trained musher and play with the dogs. Even got to touch a 10-day old baby Huskie. Very fun experience seeing these hard working dogs and the people who love them. Best excursion of the trip! Best excursion of the trip! Highly recommend dogsledding on Mendenhall Glacier. Dog sled camp was neat to see and learn about the Itarod, since it was raining, the dogs were wet and crabby.